Mountains, desert, and ocean collide to create breathtaking views. Incredible rock formations jutting from the deep blue water are where my mind immediately goes when I think about the landscape of the Sea of Cortez. One of my favorite things was waking up each morning to see another gorgeous sunrise peeking out from behind one of the rock formations. 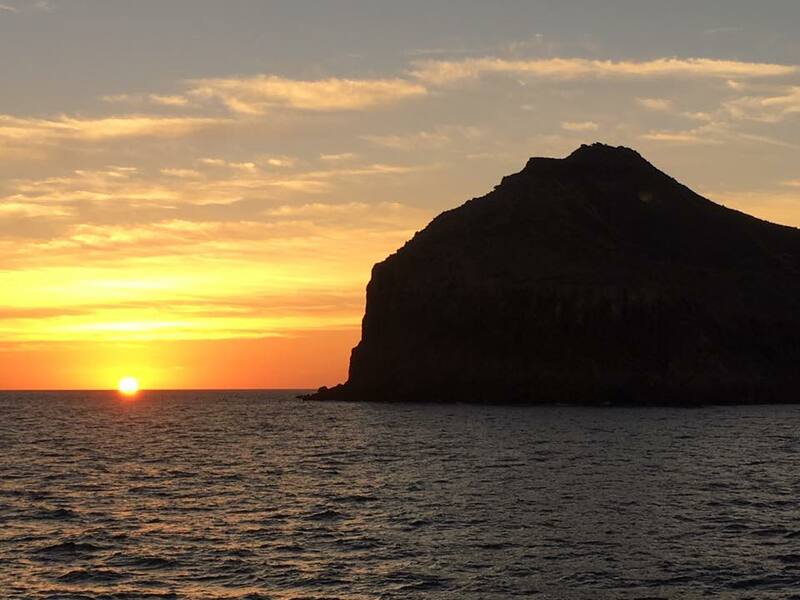 Sunrises from a cruise are already one of my favorite views in the world, but there was something about Baja’s sunrises that placed it at the top of my list. Baja California was formed by volcanic activity and earthquakes of great magnitude that caused the land to split away from mainland Mexico. The result is a landscape dotted with islands (37 of which are in the Sea of Cortez) and unique cliffs. The various islands and coasts that we visited were each so unique and equally gorgeous. Isla San Francisco was probably my favorite—especially from the top of the ridge as we looked down on the shocking teal water that faded into deep blue. The rust colored mountains in the background and strip of white beach perfectly contrasted the water. While we were riding burros in the desert, we happened upon an oasis. Little things like this were constantly surprising us in Baja. The marine life in the Sea of Cortez is incredibly diverse. With over 900 fish and 2000 marine invertebrates, this sea is the richest body of water on the planet. There was a whiteboard near the lounge where everyone was invited to write the various marine life they spotted; by the end of the week it was completely full. In addition to the fish and sea life we saw while snorkeling, we also saw many larger sea creatures. On our first full day, dolphins swam and played with our ship (more on that in the next installment!). Another day, we spotted Sperm Whales and Pilot Whales from the boat. There were also sea turtles and flying mantas spotted on multiple occasions. While snorkeling and swimming with the sea lions, one brushed against my hand, and we saw pups playfully chasing each other through the water. My husband and other snorkelers who like a challenge also swam with whale sharks. I was happy to view them from the boat. Along with the diverse marine life, we also saw many other creatures including indigenous birds, crabs and lizards. Various types of cacti, flowers, plants, and rocks were also part of our Baja explorations. I have never been anywhere quite like the Sea of Cortez, with its unique marine diversity and stunning landscapes. Once you experience it, you will always hold a piece of Baja in your heart.